In Microsoft Dynamics AX 2009, the Arrival overview form is introduced to improve the overview of items expected to arrive as incoming goods. The new feature provides an overview of all expected incoming items and arrivals can be initialized based on the overview. The focus of this blog post is the functionality of the Arrival overview form and the receiving process. For more detailed descriptions, please refer to the Trade and Logistics I in Microsoft Dynamics AX 2009 and the online Help. Consider the following scenario to learn how the feature can support the tasks of the inbound processes. Assume that Sammy, a receiving clerk, wants to know what is expected to be received on the same day. In the Arrival overview form, Sammy can get an overview of the current tasks and a rough estimate of quantities, volume, weight, different order types, and so on. Subsequently, assume that a delivery arrives at one of the inbound docks and Sammy receives a list of the delivery. Identify the matching receipt order and register the receipt as In progress. The lines required for a registration are generated automatically, and the receipt can be monitored even though the transactions have not yet been posted as Arrived. Access the appropriate arrival journal reference, that is, the Item arrival journal or the Production input journal, and identify journals that are ready for a packing slip update. 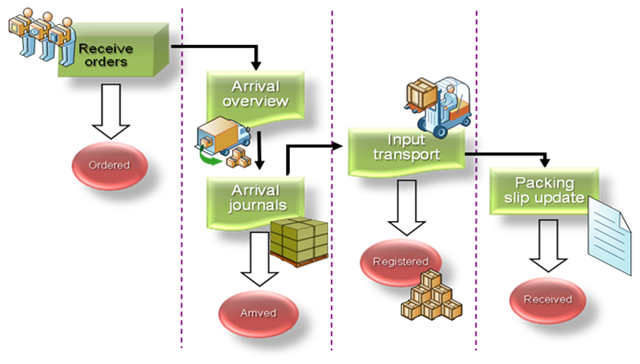 The Arrival overview form is located under Inventory management > Periodic > Arrival overview. In the form you can view a list of expected orders to be received. The overview is divided into header and lines. The header information is grouped by the order type, expected receipt date, and delivery destination. When a header line is selected for arrival, all the detail lines that are related to this specific receipt reference are selected for arrival in the line details part of the form. When all lines have been posted as item arrivals or are in a later state, this information is not displayed. The Arrival overview form provides an overview of items that are expected to arrive and the date they are expected to arrive. The settings in this form can be saved for individual users and for individual computers so that users can have their personal settings on computers in the inbound area. One user can maintain multiple sets of personal settings. Under Site, a site in the Restrict to site field to limit the view in the overview area. In the Transaction types shown group, the Production orders check box. 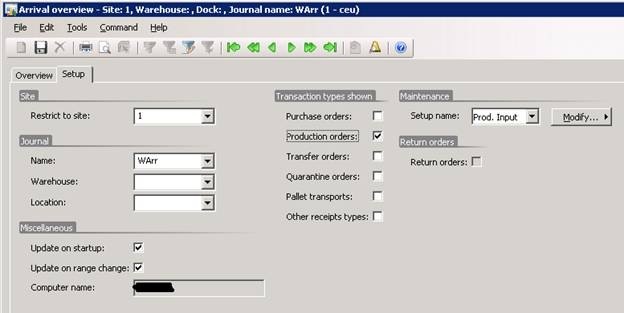 In the Journal group, a receiving warehouse, a location, and a journal name (item arrival/production input). In the Miscellaneous group, the Update on startup check box to have the view updated automatically on startup and the Update on range change check box to have the view updated automatically when changing range values. In the overview area under Range, information about a day interval and the warehouses to include in the overview. Sammy saves the setup under the name “Prod. Input” by clicking Modify > Save as on the Setup tab. A journal name must be specified to create a journal. 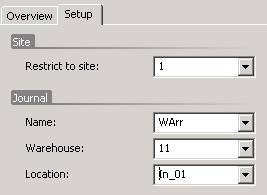 If Site, Warehouse, and Location are specified, these values are applied on the journal lines. If no values are entered here, the values from the dimension specified on the inventory transactions are used. Receive items from one or more expected receipt orders. Sammy selects a line under Receipts and clicks Start arrival. All related lines within the specified range and with a quantity to register are automatically selected. 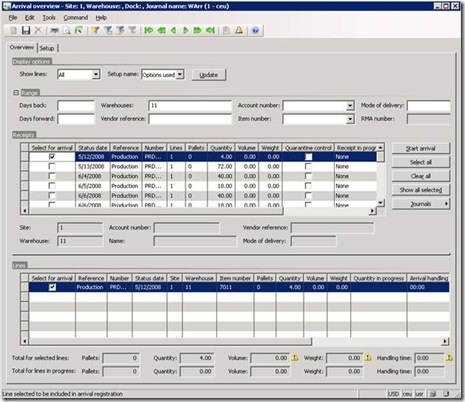 An item arrival journal is generated with a match between the expected receipt order and the journal. All lines are created with an automatic initialization of quantity. Sammy multi-selects lines under Receipts and clicks Start arrival. An item arrival journal is generated with a match between all the expected receipt orders and the journal. All lines are created on one item arrival journal header with an automatic initialization of quantity. Get an overview of expected receipts within a date interval. All related receipt orders for an infinite number of days back from the system date including the system date (the InventTrans.StatusDate interval) and receipts to warehouses GW and MW regardless of status. Detailed line information for more than one order. Sammy can multi-select header lines in the overview to view the corresponding line detail information for all selected header lines. Information about a specific purchase order. Sammy can enter a reference Number in the Vendor reference field, to only display information related to the specific reference number in the overview. 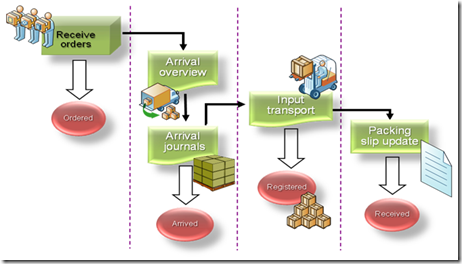 An overview of the registration tasks that are due for all the order lines where an item arrival journal has been created but not yet posted. To view this information, Sammy can select In progress in the Show lines field. To register one or more order lines due to be processed, Sammy can select the lines in the overview grid or in the line grid and click Journals -> Show arrivals from receipts. The item arrival headers that match the lines are shown. To packing slip update registered items, Sammy can access the item arrival journal headers that are ready for update from Journals -> Packing slip ready journals. 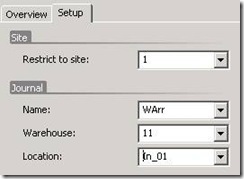 All the header lines that are ready for packing slip update within the specified Warehouse range (not day-interval related) are shown. 1) Activate the Vendor reference field in the Arrival overview form and scan a reference number from a vendor such as a packing slip barcode. Then click Update to update the overview and the details part of the form to only show the corresponding search criteria records. 2) Manually select or deselect records for arrival registration in the overview or the details part of the Arrival overview form. When Sammy clicks the Start arrival button, the selected records are automatically created in an item arrival journal, including line information with all possible unique field information assigned. 1. Click Inventory management > Periodic > Arrival overview to open the Arrival overview form. 2. Click Journals > Packing slip ready journals to display a list of the journals that are ready for packing slip update. 3. Select the journals that must be updated, and then click Functions > Packing slip to open the Posting form. 4. Enter the packing slip number, if it is not already available on the journal, and then click OK to post the packing slip. The Arrival overview form can help the warehouse manager and warehouse workers achieve an overview of expected work to be done as part of an inbound process. The form can also be used to start the item arrival process to make sure that items are tracked at the first entry into the warehouse. By Ievgenii Korovin, Per Lykke Lynnerup & Bibi Christensen, Inventory Management, Microsoft Dynamics AX.